The NADS group, Down Syndrome and More, serves families whose child with Down syndrome has an additional diagnosis, such as Autism or ADHD. The More Than Down Syndrome Retreat is offered twice a year. During the Retreat, parents learn from experts and share with each other while their child with a dual diagnosis engages in fun activities and is cared for by trained respite workers. For more information about this program, please contact NADS. Many of the resources the members of this group have gathered over the years are collected below. For more information about Down syndrome and Autism, including signs and symptoms, obtaining an evaluation for autism, and related behaviors, see the dual-diagnosis section on the website of the National Down Syndrome Society. Bondy, Andy and Lori Frost (Woodbine House, 2011). An introduction to the Picture Exchange Communication System, which is used by many people with disabilities to communicate basic needs. McClannahan, Lynn, 2nd edition (Woodbine House, 2010). Covers how to use activity schedules to structure tasks and teach skills. Provides routine dental care for children and adults with developmental disabilities. An organization dedicated to improving the lives of all affected by autism. An organization with the goal to change the future for all who struggle with autism spectrum disorders. CABS provides clinic, school, and in-home ABA and speech therapy services to families located in Northwest Illinois. Charlie’s Gift addresses the needs of children and families facing autism and related disorders through speech, occupational, behavior therapy, counseling services, social skills development, parent advocacy and family support. All children are welcome, including those without a diagnosis. As a community wide resource serving the Chicago metro area, Charlie’s Gift strives to raise the awareness of the impact of autism and related disorders on families. Through a family-centered team based approach, Charlie’s Gift is committed to providing a range of services to optimize the development of the child and adolescent, the personal growth of the young adult, and strengthen the family as a whole. Non-profit organization serving individuals and families affected by both Down syndrome and autism spectrum disorders. Down Syndrome Education International summarizes educational research on children with Down syndrome and autism or an autistic spectrum disorder. Provides basic dental services for Illinois residents with developmental disabilities. Little Friends is a private, non-profit organization serving children and adults with autism and other developmental disabilities. Based in Naperville, Illinois, Little Friends operates 11 dynamic programs including three alternative schools, family support and consultation services, vocational training programs, community-based residential services and the Little Friends Center for Autism. Founded in 1965, Little Friends serves more than 800 people each year throughout DuPage, Kane, Kendall, Will, and western Cook counties. NADD is a not-for-profit membership association established for professionals, care providers and families to promote understanding of and services for individuals who have developmental disabilities and mental health needs. The National Down Syndrome Society provides an overview of Down syndrome and autism. Blog by a parent who has a son with Down syndrome and autism. Buggey, Tom (Woodbine House, 2009). This book provides instructions on shooting and editing video footage to help children with developmental disabilities improve skills through visual modeling of desired behaviors. A Toolbox for Helping Children Feel Safe, Accepted and Competent. The Autism Clinic and TAP Training Center at UIC is a specialty clinic devoted to serving children, adolescents, and adults with known or suspected Autism Spectrum Disorders. Housed at the Developmental Disabilities Family Clinics of the Institute on Disability and Human Development (IDHD), the Autism Clinic & TAP Training Center's mission is to improve the lives of individuals with autism and their families through clinical service, community, academic, and professional training, and research. Clinics for individuals with disabilities through the University of Illinois at Chicago's Department of Disability and Human Development. Froehlke, Margaret and Robin Sattel Zaborek, editors (Woodbine House, 2013). Survey of best practices for diagnosing, treating and providing care to children with both Down syndrome and Autism. Since 1998, NADS has provided a special service for families whose child with Down syndrome has an additional diagnosis, such as autism or ADHD. 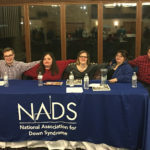 This NADS group is called Down Syndrome and More. It is often difficult for families of children with a dual diagnosis to network with local support groups. Families dealing with a dual diagnosis often feel like they don’t fit in at the local Down syndrome support group. At the same time they don’t fit in at the local autism support group either. The daily struggles are unique, leaving many families feeling isolated. 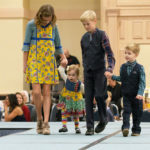 The NADS group, Down Syndrome and More, is a place for families to discuss unique challenges and added stress, share resources, teaching strategies, and medical information, focusing on possible solutions along with humorous stories in a safe, non-judgmental environment. 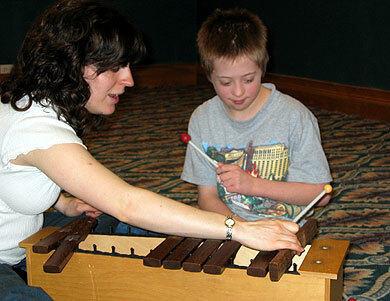 NADS offers a More Than Down Syndrome Retreat twice a year. At the Retreat, children are cared for by trained respite workers. NADS ensures a minimum 1:1 ratio at minimum for maximum safety. Children spend time engaged in fun activities such as swimming, play and music therapy. We offer this retreat for families who are under a great deal of stress to share and address issues of concern to them. During the retreat, experienced professionals tackle those issues and give practical strategies for coping with the communication and behavioral challenges of their child. 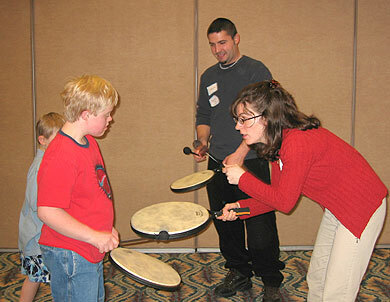 The Retreat is held twice a year, accommodating a small group of NADS families. If you are a NADS member and your child with Down syndrome has been diagnosed with autism or ADHD, please contact NADS for more information about Down Syndrome and More. For more information about Down Syndrome and autism, please see our Down Syndrome and Autism resources page. “The More than Down Syndrome Retreat is fuel for my year. We share our joys, frustrations and uncertainties together. I am reminded that we are not alone in our struggles with raising Kenny and a dual diagnosis. We have learned so much with the support and education at the retreats since Kenny’s diagnosis of autism over 11 years ago.”—Shelly C.
Illinois Crisis Prevention Network, work with individuals with severe behaviors and are struggling to maintain in their current home or placement. A comprehensive list of resources in Chicagoland area***Great site! Great Resources for special needs families. Autism Wandering Awareness Alerts Response Education has a comprehensive list of tips, materials and tools.